There are so many tweets, posts, memes, and jokes about Meek Mill, I am sure anyone can recite a Meek Mill joke faster than they can recite a lyric from Drake or Meek Mill’s dis records. It is so popular and accepted to bash Meek Mill that corporations have joined in on the fun. 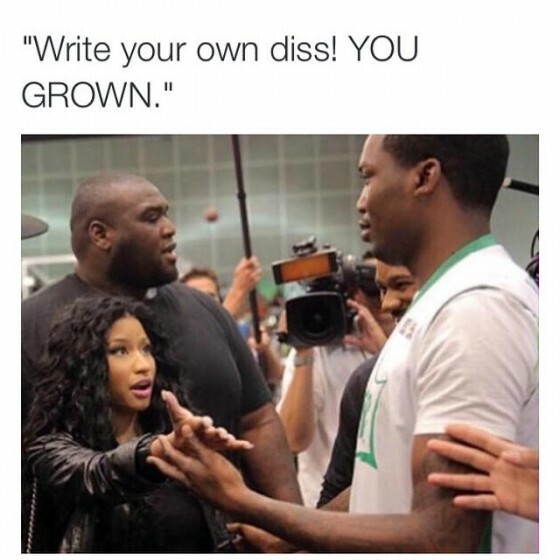 In the true essence of this entire debacle between Drake and Meek Mill, social media was the true heavyweight. Without the numerous pictures that highlighted the best lyrics in Drake’s disses with reaction pictures or gifs, would this beef have exploded to Nas vs. Jay-Z proportions? The internet is creative and lyrics like “is that a world tour or your girl’s tour” is just what the internet needs to go on a tirade. There was a common enemy and everyone, including Burger King, Whataburger and Hamburger Helper for that matter, went on to attack Meek Mill. Drake even applauded the efforts of the internet by using the pictures that ridiculed Meek Mill during his performance of “Back to Back” at his annual OVO Fest. It is the most unprofitable but somehow most mainstream beef ever. First, you have an unbalanced playing field. Tupac vs. Biggie, Nas vs. Jay-Z, Romeo vs. Bow Wow, 50 Cent vs. Ja Rule, and Gucci Mane vs. Young Jeezy are all balanced beefs. Lyrically, they can go toe to toe. Drake and Meek Mill cannot and we all know it. Drake has a talent with words while Meek Mill has talent in the streets as shown by his lack of lyricism but overload of threats in “Wanna Know.” You cannot have Romeo vs. 50 Cent and give it the same praise as Tupac vs. Biggie as if Romeo stood a chance. Secondly, when Hamburger Helper starts dissing, it is a wrap. It stopped being about the actual beef and more about jokes the second a corporation could slide in and chime about the scoreboard. In this whole debacle, Safaree released a hilarious (in a good way) diss track to Meek Mill but that was completely ignored. No one is questioning Drake on whether he writes his own bars or not but based on his need to release two diss tracks, he is a bit sensitive about that topic. Common only got a shared “5AM in Toronto” and a verse on “Stay Schemin’” as a diss and he is a rap legend. The beef was made into a complete spectacle with disses coming from Instagram, Twitter and OVO Fest. It is probably cyberbullying at this point. This internet backdrop to feud did nothing but hype up an average beef to an epic beef. Waiting for the radio to play a diss track is no longer needed. Five minutes after the songs were released, there were already memes, gifs, and short videos created and posted all over social media. There was no digestion or interpretation, only reaction. Debates were slimmed down to 120 characters and emojis. Not one person came on television and raved about the feud but with all the poorly recorded videos of Meek Mill and Drake, I could create my own segment. Television and radio was not the platform but stages and Twitter. Social media engulfed this entire clash and transformed it into an “Ether” vs. “Takeover” extravaganza even though no one will be switching up their lingo and saying that someone was “Back to backed” instead of “Ethered” when he or she is destroyed by a diss track. Has hip hop been missing beefing so much that the first sight of one that will not end in the first 24 hours forces us to react with such passion and hyperbole? If so, we need more beefs like this so we can get accustomed to dealing with rap feuds without overreacting on social media and making something so miniscule in rap history so large. It is time for practice beefs.